Erasing your Hard Drive, Two Common Ways To Erase. Erasing Your Hard Drive Completely. Merely deleting your files is never sufficient. With that said neither is just throwing away your hard drive. 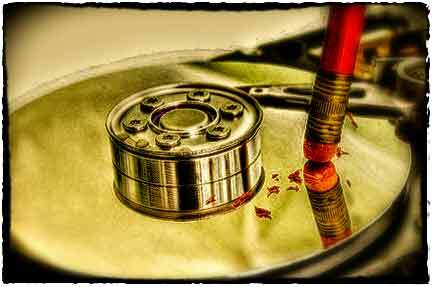 Improperly disposing a disk drive could lead to exposing your data to hackers, thieves, or even competitors. This article will explain a number of simple techniques for permanently and securely removing confidential data from old drives before recycling or disposing them. Before you throw out your old hard drive and before you plan to sell it do this first. You can still donate or give your computer away afterwards. Thus, you will need to erase your hard drive completely! Simply deleting files and formatting hard drives are not a permanent solution. Why not? Any formatted or even trashed hard drive is a data bank for data thieves and hackers. Therefore, erasing the entire data system on your hard drive and formatting it is not enough. Read about this Cybersecurity problem from The Washington Post. Erase Social Security Numbers from Hard Drives. When you delete data form you hard drive, it does not actually get erased until you write a new data set of ones and zeros (1, 0) over that same exact space, until this takes place all your data remains. One should make sure that the data in the hard drive is unquestionably erased so the vital data information such as your social security numbers, credit card information, passwords, military data, financial information, medical records, details of business negotiations, and other sensitive statistics will not be exposed. In practice, these are two of the most common ways to erase your hard drive completely. First destroy the hard drive entirely. Destroy the hard drive completely, this doesn’t really erase all the data, but it does makes it unreadable. Use any method you want and destroy all the platters inside the drive, be sure the platters are crushed into pieces and completely destroyed. Second, hard drive formatting & nuking. Disc scrubbing/wiping, it is far more secure than just reformatting. The term disk wiping is not only used for hard drives, but for any storage devices. Free programs like “Darick’s Boot and Nuke” create a bootable drive that automatically reaches out and erases any drive it can access of your choosing. It is a secure method of ensuring that the data on your hard disc and storage devices is irrecoverably deleted before recycling or donating. This process of disk wiping will actually overwrite your entire hard drive with data, several times. These applications will overwrite the master boot record, partition table, and every sector. For information on professional hard drive recovery & flash drive recovery services.